Not many film industries in India are praised for the quality of its output. And Malayalam film industry is indeed one among them. We have amazing movies in almost all genres. Despite all the buzz about its quality consciousness, it is a fact that we still lack good entries in some of these genres. Horror is such a zone which is yet to be flourished. Ezra, the latest addition to the genre, is also not an exception. It is nothing but a disappointing, cliched horror flick. The horror thread in the movie goes on the same old tracks, focusing on such run-off-the mill objects as a mysterious box, nail, black-magic, revenge and funny exorcism stunts.The only novelty that the movie can claim for is the presence of a dybbuk box. In Jewish mythology, dybbuk box, or dibbuk box is a wine cabinet which is said to be haunted by a dybbuk. A dybbuk is a restless, usually malicious, spirit believed to be able to haunt and even possess the living). Jewish background and the hero's profession are the very few novel (just for the sake of saying something good about the movie) elements in the movie.What makes the movie a hit in the box office is comparatively good production quality and some other unknown elements (like a phenomenon of the collective consciousness). Not a single notable performance is there. Or the script doesn't offer such a challenge to the characters. Poor Tovino Thomas! I wonder why the director made him a too silly DCP who takes everything without a pinch of salt! A myth was doing the rounds that Prithviraj became quality conscious and choosy about his scripts. This movie proves that it remains a myth and has not yet become a reality. At the end of the show, I don't think that you will get a 'wow' feeling about the movie, until and unless this is your first horror movie experience. As a modern Malayalam saying about movies goes: "it is the same old bomb story!' 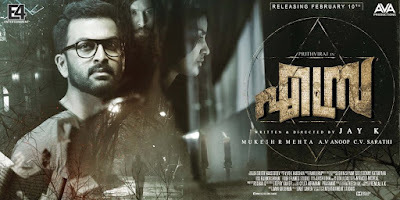 When I saw many spectators in the cinema hall giving a standing ovation to the movie, I wondered 'what happened to the tastes of Malayali movie goers who used to boast about the glory of class movies. (Oppam, Pulimurugan etc. are few other recent examples). Finally, now it is evident that hype can save a movie in Malayalam too. What a pity!